Say Yes is a perfect mix of story and history; educating and pulling at the heart strings simultaneously. Set against the landmark 1967 Australian Referendum, Say Yes is a story about two young girls- best friends- who did everything together. But as they grew older, the girls realised they weren’t allowed to do the same things or go to the same places because they looked different. Mandy had to go to a different school. Mandy was not allowed to swim in the public pool. Mandy couldn’t sit in the cinemas with her friend. Say Yes is truly a story of friendship, fairness and a vote for hope. Inspired by her own sister’s childhood friendship with young Mandy, Jennifer Castle’s text is simple and personal. I love the fact Paul Seden’s soft pencil illustrations are contrasted against archival photographs, offering true authenticity to the story. Added to this, are the colourful bold printed dresses of the era worn by the two girls. Also used as end papers, they provide the perfect paradox of similarity and contrast; an underlying theme of the story. 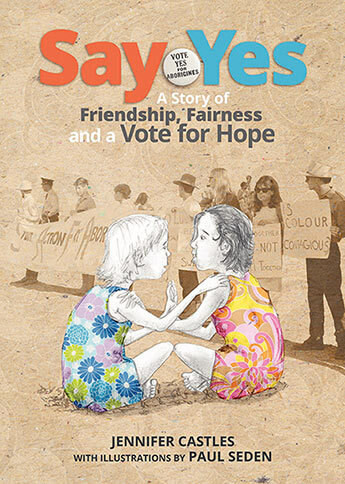 Celebrating the fiftieth anniversary of the historic Australian vote in 1967, Say Yes is an important book for all young Australians and a must for every Australian classroom.